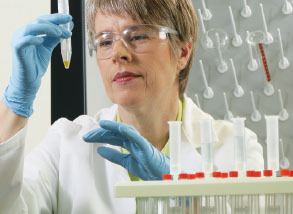 We provide an extensive range of high purity solvents for all Chromatography techniques. These include traditional solvents for HPLC, Gas Chromatography (GC) and UV Spectrophotometry and for lower analyte detection levels; we offer solvents for LC/MS and UHPLC. We have a wide-range of pack sizes and packaging from our Thermo Fisher and Ajax Finechem brands. Fisher Chemical™ Optima® LC/MS solvents; now with an unprecedented LC-UV gradient suitability specification that was developed by using advanced UHPLC technology coupled with PDA detection optics. As a result, each lot of Optima LC/MS solvent is screened for UV-absorbing contaminants at every wavelength in the 200-400nm range to afford smooth baselines, reduced interferences, and increased confidence in your analyses.